Admission to the BMSc Program occurs in Year 3. 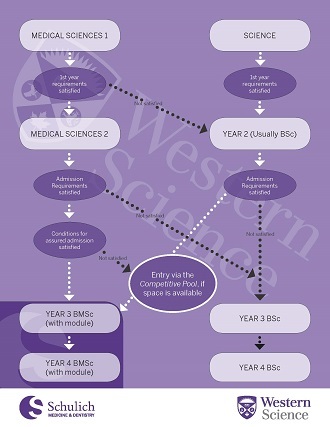 Students admitted to Medical Sciences 1 are assured admission to Year 3 BMSc provided they satisfy certain conditions in Medical Sciences 1 and 2. There should be sufficient spaces remaining in Year 3 BMSc for additional students who are admitted from the "competitive pool". The video provides an overview of progression from Medical Sciences 1 to Medical Sciences 2, admission to Year 3 BMSc, and admission/progression to Year 4 BMSc. An overiew of admission to the Honors Specialization modules is included. See the individual links below the video for more details. Medical Sciences 1 students will progress to Medical Sciences 2 provided they satisfy certain conditions (completion of specific courses with minimum marks, full load of courses, etc.). There is no limit to the number of students in Medical Sciences 1 who can progress to Medical Sciences 2. Provided all requirements are met (see the link immediately below), students in Medical Sciences 1 will progress to Medical Sciences 2. See Progression to Medical Sciences 2 for full details. There should be space in Year 3 BMSc for additional students (e.g. students in Year 2 BSc and students in Medical Sciences 2 who do not satisfy the conditions for assured admission). These students are considered as applicants from the "competitive pool" and these students must satisfy certain conditions to be considered for admission. The number of spaces remaining in Year 3 BMSc may be sufficient to admit all students from the competitive pool. If not, then admission from the competitive pool will be limited to a particular number of students. See the full details at "Admission to Year 3 BMSc for Students in the Competitive Pool". NOTE: Admission to the various Honors Specialization modules in the BMSc Program is not assured for any student as each Honors Specialization module has a maximum capacity in both Years 3 and 4. See the consequences of not submitting an Intent to Register by the deadline on admission to Year 3 BMSc and the modules in Year 3 BMSc. All students in Year 3 of the BMSc Program are assured progression to Year 4 of the BMSc Program. Students MUST be in Year 3 of the BMSc Program to progress to Year 4 BMSc. Any student in Year 3 BMSc can apply for admission to Year 4 of any Honors Specialization module, provided they complete the correct courses by the end of Year 3 (specified in the Weighted Average Chart) and have a competitive Weighted Average. Registration in a particular Honors Specialization module in Year 3 does not give students an advantage when applying for registration in the same Honors Specialization module in Year 4.